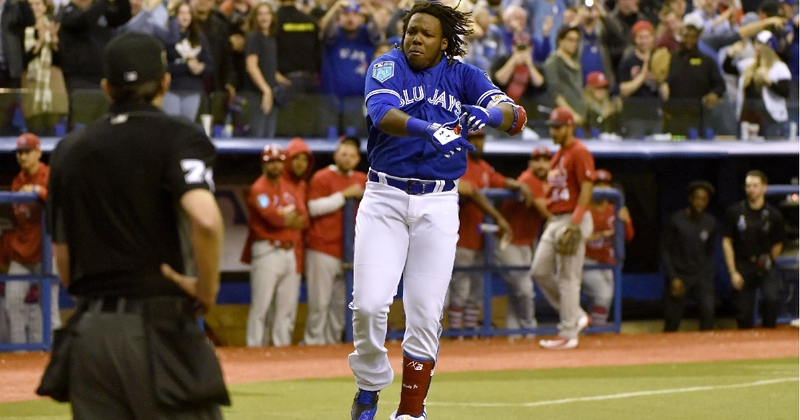 The purple prose comes free and easy when Vladimir Guerrero Jr is the subject. It comes as easily to prospect watchers and scouts as it does to those interested in the human condition. Comparisons to Hall of Famers, triple crown winners and perennial MVP candidates slip right off the ends of fingers and end up on the pages of venerable publications with better things to do than inject helium into any teen capable of running into a few wayward heaters. Caution long thrown to the wind, the message is clear: this is the one you dream on. Vlad Jr makes it easy. The praise from wizened eyes comes as easily as the game comes to the game’s top prospect, a player with as bright a future as any to ascend through the Blue Jays ranks. It comes as easily as power to the opposite field and an innate knowledge of the strike zone comes to the youngest player currently in the double-A Eastern League. It comes with the same ease with which Guerrero brings the bathead to the baseball. Fastball or offspeed, any quadrant of the zone, they get barrelled all the same. Like it’s nothing because, to him, it is nothing.